I’m a guy that likes to be surprised when he goes to the movie, but these days, it’s getting harder and harder to stay away from new movie trailers. Especially if you follow great blogs like Laughing Place. So I’ve just given in and decided to enjoy the hype, the buildup and the reveals offered by the sneak peeks. 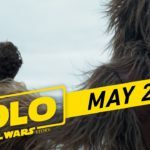 Tonight’s latest trailer for Solo: A Star Wars Story offered up some unique gems that should have any Han fan jumping online to buy their tickets once they go on sale. This trailer gives us a better sense of the story. We know that Han and Chewie are being recruited for a big job, but this time around we see the boss behind it may be Drydon Voss (Paul Bettany), appearing for the first time with terrible facial scarring. Wait, is he the boss, or is he the mark? Han (Alden Ehrenreich) clearly states his avocation: “I’m a driver and a flyer,” telling me that he may not yet be the scoundrel of later films. 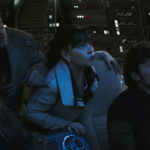 A line spoken by Qi’Ra (Emilia Clarke) suggests that she is in on the heist, mentioning that she has a “line on a guy with a ship,” introducing us to the much anticipated Lando Calrissian (Donald Glover, but do I really need to say that?) and his first spoken line: “Everything you’ve heard about me is true.” Sounds like Lando, unlike Han, is already the fully fleshed out con artist that we first met in Empire Strikes Back. But are the rumors true? Or is he just allowing the myth to define him? Gambling chips tumble across a table, quick glimpses at the Millenium Falcon flash across the screen, and it would seem that we are going to watch how Han wins the Falcon from Lando. Will it be early in the film, or a capping moment at the end? Either way, I don’t care…as long as we get to see it happen. 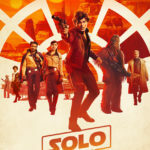 As Tobias Beckett (Woody Harrelson) considers Han’s participation in the heist he’s planning, he offers Han the of advice, or warning, “Come with me and you’re in this life for good.” Beckett’s final words are delivered darkly: “Assume everyone will betray you and you’ll never be disappointed.” As we know, again from ESB, Han tries to live by this credo, but does not take this advice to heart in Cloud City and ends up in a bit of a hard (and cold) spot. But does he allow that advice to motivate him in this film? His optimistic line, “I’ve got a really good feeling about this,” while a hilarious reversal from his now-famous (and too often repeated) line tells me that we will see a very innocent Han who is rocked by the harsh realities of the galaxy and will be tempered by danger, loss and betrayal. Who will he lose? My sabacc chips are on Qi’ra. (Though I’ll admit, every time I see Thandie Newton in a Solo trailer, I can’t help but think of Sana Starro/Solo…but I guess with her name being Val, the film makers decided to steer clear of that comic book story line). This go-around, we also seem to learn the scoundrel and Wookiee are fairly new friends. “190 yrs old? You look great!” Han declares after Chewie answers his question about time to gain piloting experience. If Han doesn’t know Chewie’s age until now, does that suggest that the next scene, of Han holding onto Chewbacca’s hand as the Wookiee dangles from the edge of an elevated train, does that mean we will see the events that bound Chewie to Han in a life-debt? It’s looking very likely. The balance of the trailer is peppered with amazing scenes of battle, both on the ground and in space. From Chewbacca smashing an attacker headfirst into the ground, to L3-37 (Phoebe Waller-Bridge) participating and commenting sarcastically through out (maybe building off the popularity of a certain K-2SO?) it is important to understand that this isn’t just a film about a young Han. It isn’t just another entry in the Star Wars Cinematic Universe. It will very likely be an amazingly well-done heist film directed by the perennially proficient Ron Howard.